Location: Main Index » Forum Index » Chevrolet Cars 1958-1970 » 1965-1966 Fullsize Chevys » correct flasher no.??? My '65 SS Impala has an aftermarket flasher that has stopped working. I looked in my owners manual but don't see a number for a correct Delco flasher. Edited by vet65b on 04-08-19 07:22 PM. Reason for edit: No reason given. 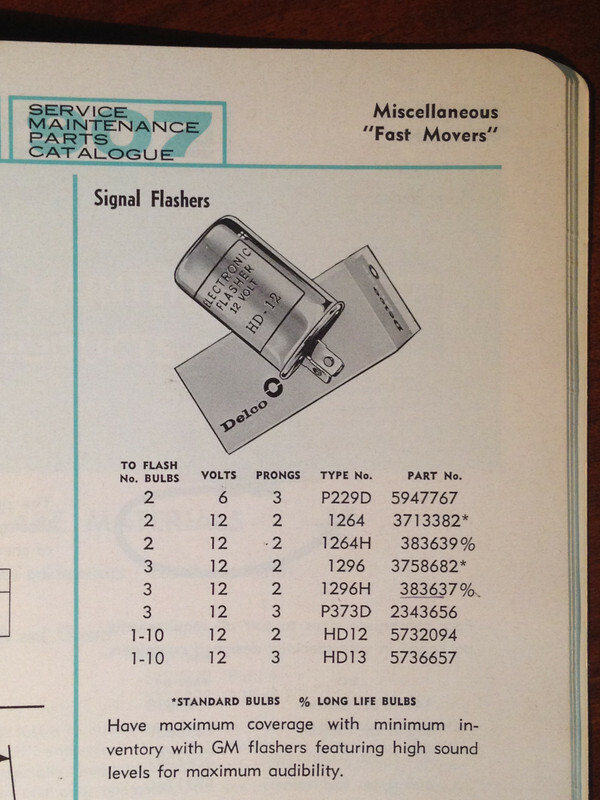 According to this US parts book it's a Signal-Stat 145 or a Tung-Sol 323 both GM part number 383639. Was only one or both brands used on the assembly line, I don't know. If both brands were used, then which plants used which one, I don't know either. My Oshawa car used a round HCS Tridon flasher on the fuse block so it's entirely different. They changed in appearance over the years, but here's the look of back in the day. After digging through my assembly manual I found in section 12, page 2, a note listing four different flashers, but they were listed by GM part number which didn't help. Good eye, page 146 on the pdf document for a quick find. Blue for the Tung Sol flasher is specified so that would be the 224, but notice it's for 15000 series Biscayne and Bel Air. 16000 series Impala with the extra tail lamps used a higher capacity flasher. The revision notes pertaining to the flashers state the diagram numbers 383636 and optional 383637 for 16000 series replace previous numbers. It would be interesting to see a 383636 example too, but the parts book calls out Tung Sol or Signal Stat so I'd say you're good with either brands 323 or 145. Good numbers for Canadian Impala would be the 1296H/383637 which also appears in the US catalog and HD12/5732094 which is not in the US catalog. A Delco flasher is pictured so it seems that was what the dealer stocked in Canada, although in addition to Delco, I see US GM boxes with Tung Sol and Signal Stat flashers. I just went to AutoZone and bought the Bosch solid-state flasher so I could use my LED tail lights. Those mechanical, load dependent flashers are really out-of-date. Yes the newer electro-mechanical or newest solid state flashers are superior, but it seems like Bill wants a flasher like the car was born with. Thinking about it again, my pic suggestion of the silver can with the yellow silk screened label wasn't the best suggestion for being exactly 1965 correct. My dealer accessory hazard flasher came with a gold can with embossed lettering, so I think that's the correct look. I've seen silver embossed as well as green and purple depending on the year. I believe the switch to silk screening labels is a later process, but so long as the flasher is non-DOT, judges won't break your balls. Congress established DOT Oct. 15 1966, and DOT started operation April 1 1967, so any non-DOT flasher is generally correct for his 65 Impala. As far as Signal Stat brand is concerned, if the hazard flasher can is gold embossed, then I think the signal flasher should be too. A yellow round metal Tung Sol 323 would be fine too, not the later plastic one of course. Execution time: 0.074 seconds. Total Queries: 17 Zlib Compression is on.